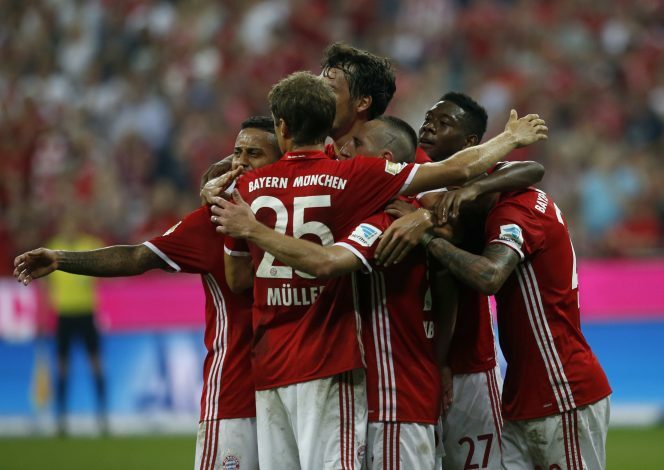 Bayern Munich have broken Manchester United’s Champions League record by winning their 13th successive home game in the competition. The Bavarian club demolished Russian club FC Rostov 5-0 at the Allianz Arena, which meant they had beaten Manchester United’s record of 12 successive home wins in the competition – a record the Old Trafford outfit have held since 2008. While Bayern continue to put up serious challenges for the Champions League title, United have fallen dramatically over the past few years, and are now languishing in the Europa League – Europe’s second tier competition – after a 5th place finish in the Premier League last year and an FA Cup triumph. The Red Devils kick off their Europa League campaign with an away game to Dutch side Feyenoord on Thursday. United boss Jose Mourinho has confirmed that Marcus Rashford will start against their Dutch counterparts, whereas Jesse Lingard and new summer signing Henrikh Mkhitaryan are unlikely to feature after their woeful showing against Manchester City in the 2-1 derby defeat on Saturday. Mourinho is likely to field a much changed side in the Europa League. Ahead of the season, the Portuguese boss confirmed that he was determined to use his entire squad this season. The likes of Phil Jones, Marcos Rojo, Morgan Schneiderlin, Ashley Young, Memphis Depay and Timothy Fosu-Mensah have all had to sit out United’s Premier League campaign, but Mourinho confirmed that he intends to give everyone a chance to play, and that many players who don’t feature heavily in the Premier League are bound to get many appearances in competitions such as the Europa League, the FA Cup and the League Cup. “I’m really happy [with my squad]. It’s the first time I’ve worked with such a number of players because I’m used to working with 20 plus the keepers. “We have, in the squad, 23 plus the keepers — and even so we had to make decisions and let some players go on loan, and try to sell others. “But this group of 23 is a great group and I think in this moment — and I told them this — there is a little bit of frustration for the ones that I have not selected. “They work hard to be in the match and they aren’t, and this is going to happen because we have just one Premier League match.